Geographical information can be invaluable to patrons doing genealogical research. To help with this research, the reference department has compiled the following timeline for the creation of towns, townships, and boroughs in Morris County. New communities and their boundaries were established by acts of the NJ State Legislature. These are noted below when available. (PL=Public Laws, c=chapter of that year’s law, p=page number). For information on wills or land and church records, see Hunterdon County (from which Morris County separated on March 15, 1738/39), or Burlington County (Hunterdon separated from Burlington on March 11, 1713/14). Constables are appointed for Whippenng and Poquanick. From the Hunterdon County Court Minutes. Morris County is established. Morris County includes Morris Township, Pequannock (also referred to as Poquanick or Peqannoc), Hanover Township, and “Morris Town.” From the Court of Common Pleas. Roxbury is established. Roxbury includes Kenvil (previously known as McCainsville), Landing (previously known as Drakesville), Ledgewood, Port Morris, and Suckasunny/Succasunna (its name is changed in 1888). By 1740, most of Morris County is made up of the communities of Pequannock (north), Hanover (central/east), Roxbury (west) and Mendham (south). Mendham Township is established from Hanover, Morris, and Roxbury Township. The NJ Legislature establishes 104 new townships throughout the state. Washington Township is established from Roxbury. Center of Township is known as Long Valley or German Valley. Chester Township is established from Roxbury and Washington Township. Jefferson is established from Pequannock. Randolph is established from Mendham. From PL 1805, p. 145. Chatham Township, including what is now Chatham Borough, is established. Rockaway Township is established from Pequannock. Morristown is established from Morris Township. Passaic Township is established from Morris Township. The name is changed to Long Hill Township in 1992; additionally, there are sections within Long Hill Township named Stirling and Millington. From PL 1866, p. 666. Boonton Town is established from Pequannock and Hanover. From PL 1866, p. 506. Boonton Township is established from Pequannock. Montville Township is established from Pequannock. From PL 1867, p. 936. Dover Town is established from Rockaway and Randolph. It is called Dover City during 1896-1899. Mt. Olive Township is established from Roxbury. From PL 1871, p. 695. Madison Borough is established from Chatham Township. Mount Arlington Borough is established from Mount Olive. Mount Arlington gains more land from Roxbury Township. Rockaway Borough is established from Rockaway Township. This area was previously known as Rockaway Village. Netcong is established from Roxbury and Mount Olive Township. This area was previously known as South Stanhope. Port Oram is established from Roxbury. The community is made up of the settlements of Port Oram, Irondale, Luxemburg, Maryville and Mount Pleasant. The name is changed to Wharton Borough in 1902. Chatham Borough is established from Chatham Township. Florham Park is established from Madison and Hanover. Butler Borough is established from Pequannock. Mendham Borough is established from Mendham Township. Denville is established from Rockaway Township. Lincoln Park is established from Pequannock. Kinnelon Borough is established from Pequannock. This area was earlier known as Charlotteburg. Harding Township is established from Passaic. The township includes sections Green Village and New Vernon. From PL 1923, p. 587. Riverdale Borough is established from Pequannock. Mine Hill is established from Randolph Township. Mountain Lakes Borough is established from Boonton and Hanover Township. Morris Plains Borough is established from Hanover Township. Parsippany-Troy Hills Township is established from Hanover Township. From PL 1928, p. 893. East Hanover Township is established from Hanover Township. Chester Borough is established from Chester Township. From PL 1930, c. 67. Victory Gardens is established from Randolph. Victory Gardens had been a temporary community of defense industry workers during World War II whose municipal services were provided by Randolph Township. From PL 1951, c. 259. 1752: 435 property owners in the five county towns. 1853: 11 towns of Morris County, Rutgers University, Special Collections. 1868: County atlas includes names of property owners. 1887: County atlas includes names of property owners. 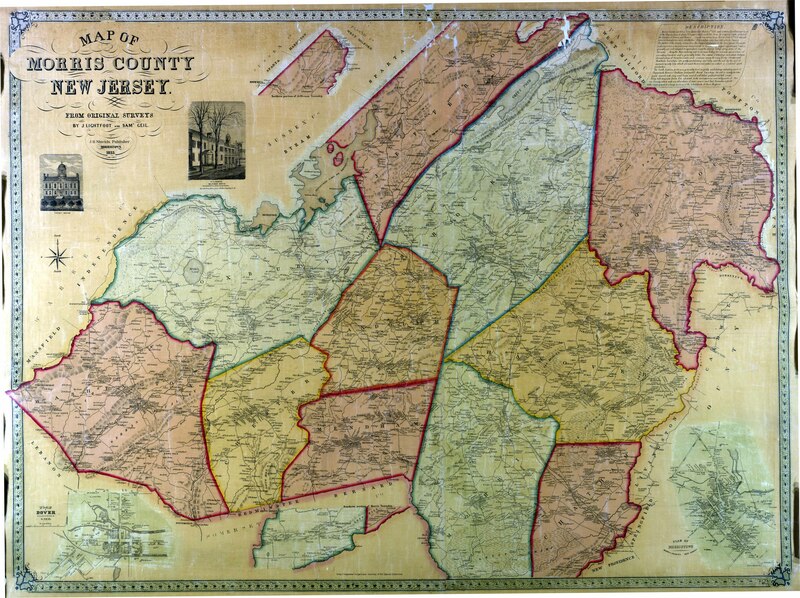 The Story of New Jersey’s Civil Boundaries, 1606-1968, by John P. Snyder.